A 2017 report from the University of Washington summarizes current scientific knowledge on chemical oil spill dispersants and their potential impacts on shoreline habitats in San Juan County, Washington. If an oil spill occurs in San Juan County marine waters, responders may use dispersants to help deal with the spill. In this report, we review what scientists currently know about how well different kinds of dispersants work and how using dispersants may affect local marine organisms. There is a lot of published information on dispersants. We aimed to distill information relevant to San Juan County (SJC) into concise, plain language that informs the county’s decision makers. We gathered most of the information for this review from books on dispersants (Fingas 2011; NRC 2005), government reports, and recent primary literature (papers published after 2012). The scope of this report covers chemical dispersants that responders could use to deal with a major marine oil spill in SJC waters. While oil spills also happen on land, we focus on marine spills because most major spills (>10,000 gallons) happen in the ocean. From 1970 to 1997, spills from ocean vessels constituted 59% of the total volume of major oil spills in Washington (Neel et al. 1997). Furthermore, if a major spill does occur on the mainland, the oil would reach SJC by water. We also focus on surface spills because there are currently no deep-water oil wellheads near SJC. We structured this report to follow a flow chart that a decision maker might use when considering dispersants (Figure 2). This flowchart is for outlining thought process only; a formal decision process is outlined in the 2017 Northwest Area Contingency Plan (NWACP 4000-31). The science available does not give clear-cut answers to the questions in Figure 1 because all research studies have inherent uncertainty and are limited in application. For example, much information on dispersant efficacy is based on laboratory tests and may not apply precisely to real-world spills. This review is thus a somewhat simplified view of our current state of knowledge. Dispersants break up large oil slicks into tiny oil droplets by changing how oil interacts with water. On their own, oil and seawater mix poorly because their molecular structures give them opposing chemical properties. Oil tends to interact with itself (hydrophobic) and water tends to interact with itself (hydrophilic). Dispersants can interact with both oil and water because they contain surfactant (surface-active agents) molecules that are hydrophobic on one end and hydrophilic on another. Similar to laundry detergents, dispersants work at the oil-water interface and help break oil slicks into oil droplets surrounded by surfactants. Ideally, the droplets then become entrained in the water column, diluting their toxic effects, and become less likely to resurface and join the surface slick (CRRC 2017). A potential benefit of dispersants breaking oil into droplets is for microbes to consume the droplets. The idea is for marine microbes (such as bacteria) to biodegrade the oil—to “break down” oil droplets into less toxic substances (NRC 2005; Prendergast and Gschwend 2011). Microbes can access oil droplets more easily than large oil slicks because droplets have more surface area per volume. Figure 1. Chemical dispersants are designed to increase the formation of oil droplets that become entrained in the water column1. This is Figure 3-1 from NRC (2005). How well a dispersant breaks up an oil spill depends on the dispersant’s operational, hydrodynamic, and chemical effectiveness (NRC 2005). 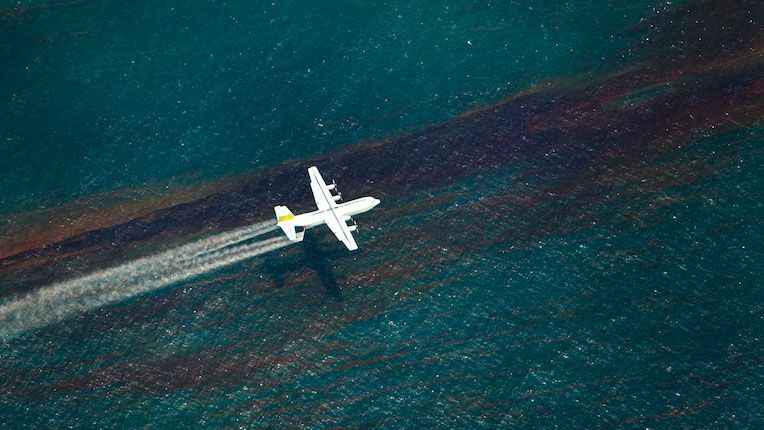 Operational effectiveness refers to how well the dispersant is applied to an oil spill (e.g., how much sprayed dispersant hits an oil slick). Hydrodynamic effectiveness refers to how well dispersed oil dilutes and moves away from the plume. See NRC (2005) and Fingas (2011) for information on operational and hydrodynamic effectiveness. Chemical effectiveness refers to how well a dispersant breaks up oil into droplets. A dispersant’s chemical effectiveness depends on the chemical properties of the oil, the 3 properties of the dispersant, and the environmental conditions. Dispersants have changed over time. First-generation dispersants (before 1970) were designed to clean engines and contained highly toxic solvents (Lyons and Castaneda 2005). Various reformulations led to the modern dispersants currently in use (second- and third- generation dispersants), which are designed to have lower toxicity (Bejarano et al. 2014); some have ingredients (and toxicities) similar to household cleaning products (Word et al. 2015). King, William and Dethier, Megan N. (2017). Oil dispersant effectiveness and ecological consequences in San Juan County marine waters. University of Washington Friday Harbor Laboratories. publ. Encyclopedia of Puget Sound. 25 pgs.